With games starting in just a few weeks, we’re tipping off our 2018-19 Big 12 coverage by going around the league team-by-team. Be sure to check in throughout the season and follow Big 12 correspondent Brian Goodman on Twitter @BSGoodman. The Cyclones predictably regressed last season after losing perhaps the best point guard in program history in Monte’ Morris, plus Deonte Burton, but what wasn’t predictable was just how bleak the season would go. Iowa State finished 13-18 overall (4-15 Big 12), marking its first losing season since 2009-10. Steve Prohm’s team didn’t win a single true road game in 10 attempts on its way to finishing dead last in the Big 12 on defense and ninth on offense. On the plus side, the Cyclones managed wins against Texas Tech and West Virginia, showing glimpses of how good they could be on occasion, but that didn’t happen nearly enough to make the season a success. The good news is that there’s nowhere to go but up with many of their most talented pieces returning. Iowa State on the Rise? Last Friday, our very own Chris Stone noted the Big 12’s supremacy in Ken Pomeroy’s conference rankings. You should click the link and read through the analysis regardless, but the long and short of it is that the conference has spent the first month-plus of the regular season running roughshod over the rest of college basketball even more than it has in previous seasons. Not much has changed since last weekend, but one of the more interesting implications of the league’s sterling performance to date is how it could impact Selection Sunday. The Big 12 has sent seven teams to the NCAA Tournament in three of the last four seasons, but at this early juncture, it’s realistic to think that it could max out with eight bids because of the combination of several impressive victories in non-league play, a relative lack of head-scratching losses, and, unlike the other Power 6 conferences, the fact that the “worst loss” a Big 12 team will take in league play will not be horribly punitive from an overall resume standpoint. If the Big 12 is going to outdo itself in terms of NCAA Tournament placement this season, the team to consider is Iowa State, which looked like an afterthought following early losses to Missouri and Milwaukee. The Cyclones will now almost assuredly enter league play with nine straight wins after tonight’s meeting with Maryland-Eastern Shore, and the biggest factor in their turnaround has been the emergence of Nick Weiler-Babb, one of the most improved players in the Big 12. 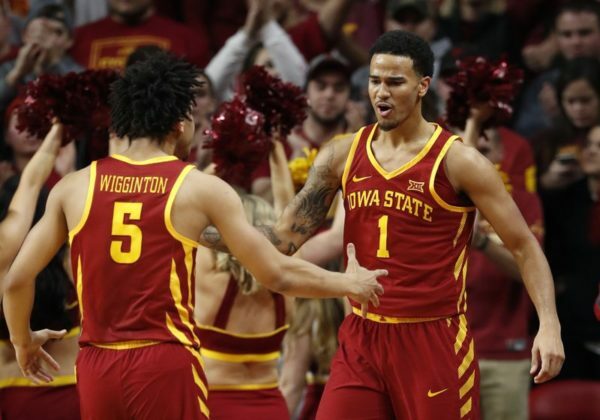 After averaging just four points per game in a bench role last season, Weiler-Babb has remarkably produced at a similar level to his predecessor Monte’ Morris, averaging 13.5 points and 7.5 assists per game while playing a staggering 37.5 minutes each night. The junior transfer from Arkansas is also the team’s leading rebounder through 10 games, although that may change with the way freshman Cameron Lard has started his career. Most of the Big 12 started its season with resounding victories over the weekend, but the two exceptions were certainly glaring as they came in matchups that pitted teams against programs from other power conferences. After a solid start to the game, West Virginia completely fell apart against Texas A&M on Friday night in Germany. Back in America, Iowa State got much more than it bargained for when the Cyclones agreed to play a very different Missouri program a year ago as the Tigers soundly defeated their old conference foe in Columbia. Elsewhere around the league, two heralded recruits got their first tastes of Division I action and did not disappoint. Here are the three items that stuck out the most over the Big 12’s opening weekend. 1. West Virginia falls flat against Texas A&M. When the Mountaineer press is working and they’re crashing the offensive glass, West Virginia is incredibly tough to beat. This is not a new development, but it’s worth a reminder as the season tips off, because when they don’t do either of those things, it’s a very different story as we saw on Friday night. In an 88-65 blowout loss to Texas A&M, the Mountaineers generated turnovers on just 23 percent of the Aggies’ possessions and rebounded their own misses just 23 percent of the time. Disappointing results on those two fronts put the pressure on Bob Huggins‘ half-court offense to produce, but any chance of that was snuffed out by Billy Kennedy’s switch to a zone defense midway through the first half. Combine all of that with big shooting nights from the Aggies’ Admon Gilder (4-of-6 3FG) and JJ Hogg (4-of-5 3FG) and there was just too much to overcome. Huggins mentioned earlier this month that he may pull back on the press in spots, citing the team’s changing roster, and with the Mountaineers facing a relatively lax schedule over the next couple weeks, don’t be surprised if he utilizes those opportunities to do a little tinkering. This preview is part of RTC’s Big 12 preseason coverage. Will the new-look Cyclones gel in Steve Prohm’s first season without any holdovers from the Hoiberg era? Iowa State’s 2017 graduating class of Monte’ Morris, Naz Mitrou-Long, Matt Thomas and Deonte Burton was one of the most decorated in program history. There weren’t any surefire NBA players in the bunch, but together, they helped former coach Fred Hoiberg revitalize the program and made it possible for successor Steve Prohm to maintain that success in his first two seasons. Now that core is gone and it’s time to see what Prohm can do with a roster composed completely of his own recruits. The Cyclones return just three scholarship players from last season’s rotation, and of the group, only big man Solomon Young started. The freshman was inserted into the lineup during the stretch run, with the Cyclones going 10-2 during that period — the only two losses coming against West Virginia in the regular season finale and against Purdue in the NCAA Tournament Round of 32. Of course, all of that success isn’t fully attributable to the insertion of Young into the starting lineup, but he was a clear upgrade from the pair of Merrill Holden and Darrell Bowie and should bring the same stability to this season’s rotation. The Big 12 had a decent but ultimately unimpressive showing in this year’s postseason. Of the league’s six NCAA Tournament teams, three advanced to the Sweet Sixteen, but only one advanced to the Elite Eight, and we all know what happened from there as Kansas flamed out to Jordan Bell and the Oregon Ducks. With the offseason now upon us and some time ahead to reflect, here are a few storylines worth following this summer and into the start of the 2017-18 season. 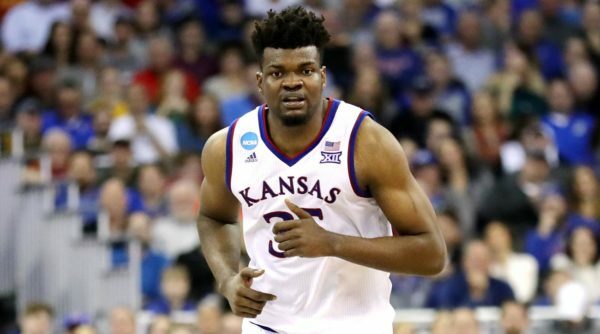 How will Kansas retool? 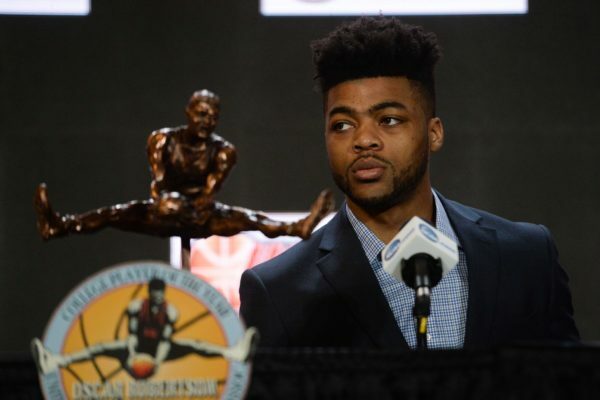 Frank Mason III leaves Lawrence as one of the most decorated players in program history. 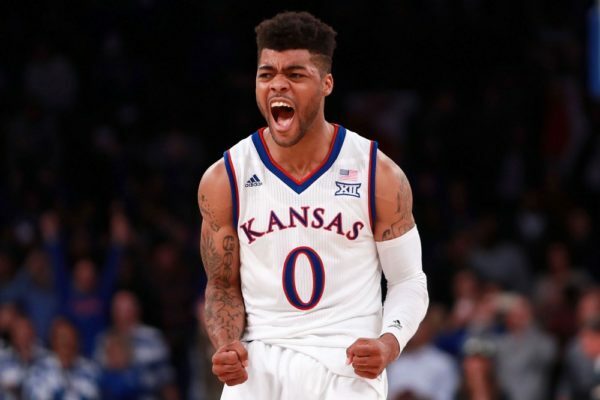 His wonderful four-year career won’t soon be forgotten, but it doesn’t change the fact that Kansas needs to figure out its point guard situation moving forward. Transfer Malik Newman can serve as the Jayhawks’ floor general in a pinch, but he’s more of a scoring guard than a facilitator and Bill Self has already said that he sees the redshirt sophomore manning the two. Barring a surprise commitment from elite point guard prospect Trevon Duval, the Jayhawks are looking at some combination of Devonte’ Graham and freshman Marcus Garrett handling the team’s ball-handling duties next season. Self also needs some frontcourt depth following the departures of Landen Lucas, Josh Jackson and Carlton Bragg, but the point guard position will be the most intriguing roster question as the Jayhawks begin their pursuit of a 14th consecutive regular season Big 12 title next fall. A new era at Iowa State. 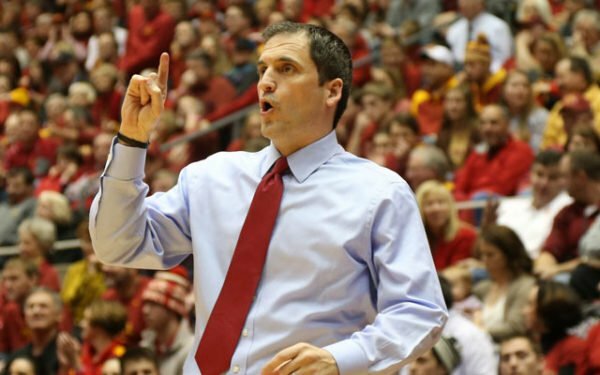 Despite 47 wins and a Sweet Sixteen appearance in two seasons in Ames, Steve Prohm needs to show what he can do without the services of Monte’ Morris, Deonte Burton, Naz Mitrou-Long and Matt Thomas in the lineup. The job now becomes one of rebuilding for the Cyclone program, but there is somewhat of a foundation from which to work. 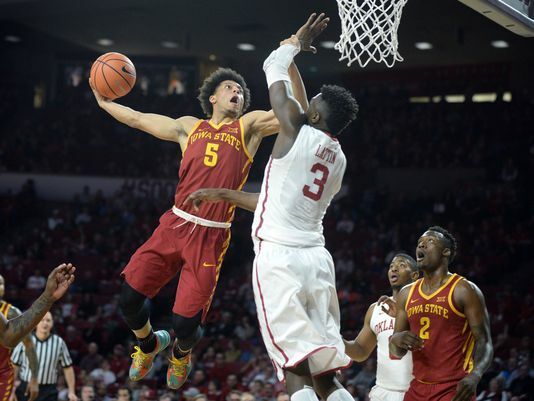 Solomon Young, Donovan Jackson, transfer Ray Kasongo, Cameron Lard and highly-touted freshman Lindell Wigginton are interesting building blocks, but don’t appear to offer the ceiling of Hoiberg and Prohm’s best teams. The early going next season may be a little rocky as this group becomes accustomed to playing with each other, but a top-half finish in Big 12 play would be an admirable achievement. Fans should additionally keep an eye on Prohm’s pursuit of coveted JuCo forward Shakur Juiston. Purdue advanced to the Sweet Sixteen for the first time since 2012 by beating Iowa State in one of the best games of the NCAA Tournament so far. Purdue was large and in charge, and this carried the day. It was fairly well-known by anybody who watches the sport that Purdue was going to have an advantage in the post this evening, and it did so by scoring 40 points against the undersized Cyclones in the paint. Caleb Swanigan, Vincent Edwards and Isaac Haas were the team’s top three players in scoring, combining for 55 of the team’s 80 points on 56.1 percent shooting for the game. Tournament Vincent is the best Vincent. Edwards has yet to have a poor effort in thefour NCAA Tournament appearances over his career — the junior forward now boasts averages of 20.0 PPG, 9.0 RPG, and 3.8 APG on 54.2 percent shooting from the floor. He led the Boilermakers in scoring again tonight, doing most of his damage at the rim. Were it not for Swanigan’s heroics at the end of the game, Edwards would have easily been deserving as the best player on the floor. 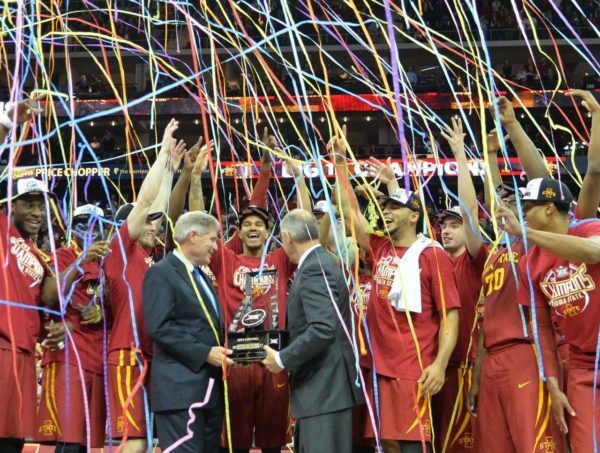 This was a brutal way for the career of Iowa State’s seniors to end. Even as a neutral party on press row, watching the careers of four seniors end with such a tough loss was difficult to watch. The foursome of Monte’ Morris, Matt Thomas, Nazareth Mitrou-Long and Deonte Burton will go down as one of the best senior classes in Iowa State history, and they deserve to be commended for the way they fought back to put the heat on Purdue in the second half. Star of the Game. 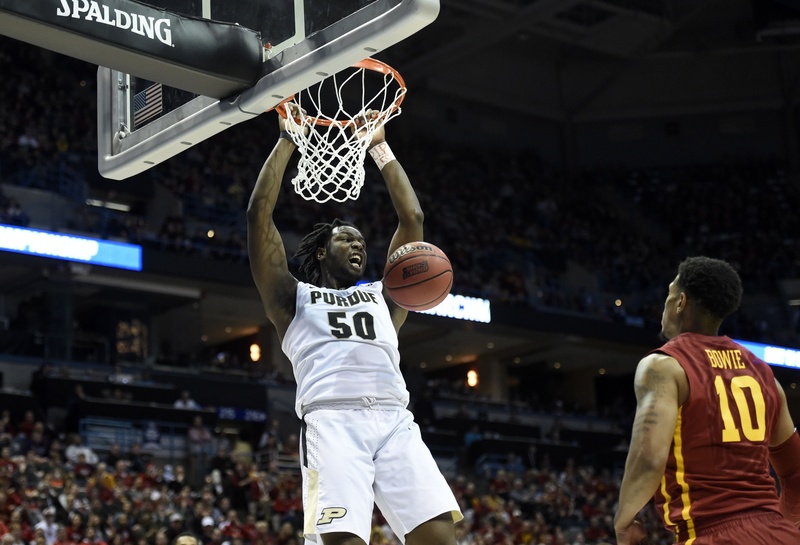 Edwards was extremely good in this game, but it’s hard not to give Purdue’s Caleb Swanigan the nod here. It wasn’t his best or most efficient offensive game, but he still scored 20 points, grabbed 12 rebounds, and offered a team-leading seven assists. He’s been a solid passer all season long for the Boilermakers, but he really did a nice job feeding Edwards and Haas from either the high post or down on the blocks. Iowa State won the most entertaining of the four-game session today in Milwaukee, doing so behind the stellar play of its senior class. Every time Nevada made a run, one of the Cyclones’ four senior starters had an answer. This was the highest level and most fun game of the day. It actually wasn’t even close. Between the multiple comeback attempts from Nevada every time the Wolf Pack would get behind by double-figures to the high level plays above the rim, it was the most entertaining game by a landslide. There were multiple tweets that went out from this writer telling people at home to switch over and watch. Iowa State is going to be a really difficult team to beat. The team that ends up removing Iowa State from the bracket (and this is certainly not meant to rule them out of the National Championship picture) will have to figure out how to bend the will of four extremely mentally tough seniors — Monte Morris, Naz Mitrou-Long, Matt Thomas and Deonte Burton — who simply do not crumble in the face of pressure. This team has confidence and experience in spades right now, which is a dangerous combination in March. Nevada lived up to its billing. Nevada’s talented trio of Cam Oliver, Marcus Marshall and Jordan Caroline exhibited their talent and resilience in how they kept coming back. Had the Wolf Pack not missed a number of easy shots in the first half, things might have turned out differently in the end. This was a fun team with several multi-skilled athletes who played at a fast tempo. Star of the Game. Monte’ Morris didn’t have his best game of the season, but he nearly notched a triple-double tonight on his way to 19 points, eight rebounds and eight assists. As mentioned at the top, his quartet of Cyclone seniors were there to get a key bucket each and every time Nevada made some kind of run. A seven-point working margin was officially stretched and finished off when the floor general drew a foul shooting a three with 2:00 remaining. Despite Oklahoma‘s Final Four run last season, the Big 12 continues to fight a public relations battle for reasons both earned and not when it comes to NCAA Tournament success. Kansas State‘s win over Wake Forest in Tuesday’s First Four started things off on a positive note, but the league still has plenty of work ahead. Here are the keys to each of the conference’s six games taking place over the next couple of days. Frank Mason looks to end his career with a national title (Getty). #1 Kansas – Show up. The Jayhawks have had plenty of rest over the last couple of weeks, so Friday’s game is about shaking off the rust. A handful of #15 and #16 seeds over the last decade have hung with Kansas for 20 or so minutes, but UC Davis wasn’t competitive in its only game against a Power 5 school this season — an 86-61 loss to California in November. 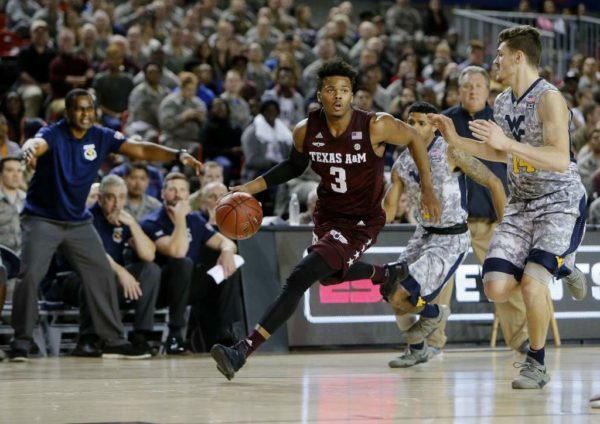 Additionally, the Aggies have only won their last three games by a combined nine points, so they’ve beaten long odds to even get to this point. There’s no need to overthink this. With just a few hours to go before the brackets are revealed, there are aren’t many programs around the country riding a bigger wave than Iowa State. Steve Prohm‘s team has elevated its play over the last several weeks and is clicking at precisely the right time, downing Oklahoma State, TCU and West Virginia in succession en route to its third Big 12 Tournament crown in four seasons. This isn’t the most talented Cyclones team since Fred Hoiberg resurrected the program, but it may be the most cohesive. Here are three key reasons why. 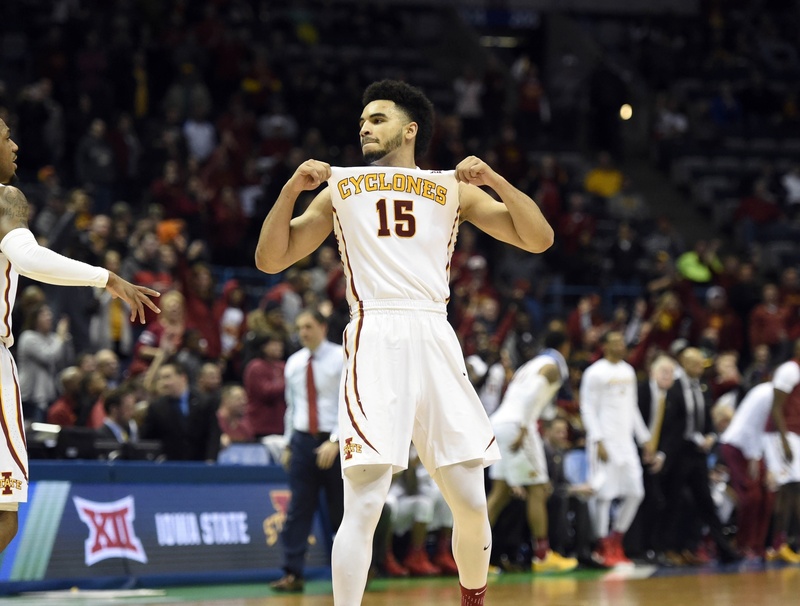 Veteran leadership: The is a cliche rooted in truth — the Cyclones’ core of Monte’ Morris, Naz Mitrou-Long and Matt Thomas comprise the winningest class in program history. Their run started as supporting players on the 2013-14 squad, the first Iowa State team to make the Sweet Sixteen since the Larry Eustachy era. Following their first-round NCAA Tournament loss to UAB a year later and Hoiberg’s subsequent departure to the NBA, a vocal subset of fans questioned the sustainability of the Iowa State program. While Prohm’s tenure hasn’t come without some speed bumps, his team is now in great position based on the combined strength and experience of his nucleus.